Prosperity Social Club has a special place in my heart. My father grew up in Tremont and would be sent there when it was Dempsey’s to buy a bucket of beer and a pack of smokes for the World War II GIs hanging out at the Lincoln Bathhouse next door when he was 8 years old. 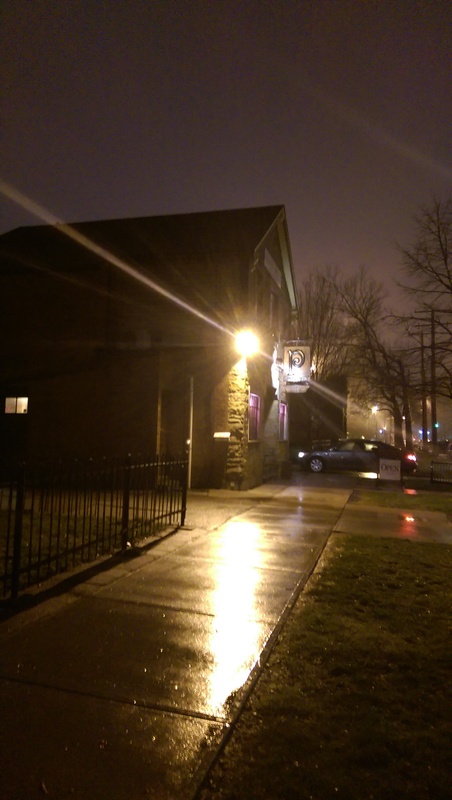 Prosperity Social Club celebrated its 10 Year Anniversary on October 22, 2015. Before that, the business had been Dempsey’s Oasis from 1938­-2005. Lots of history here. Prosperity was featured on the Travel Channel’s “Delicious Destinations” show last November. The place has been packed in the past for their fish fries, but now things are crazy. I drove past last week at 7 PM and people were standing outside on the sidewalk. 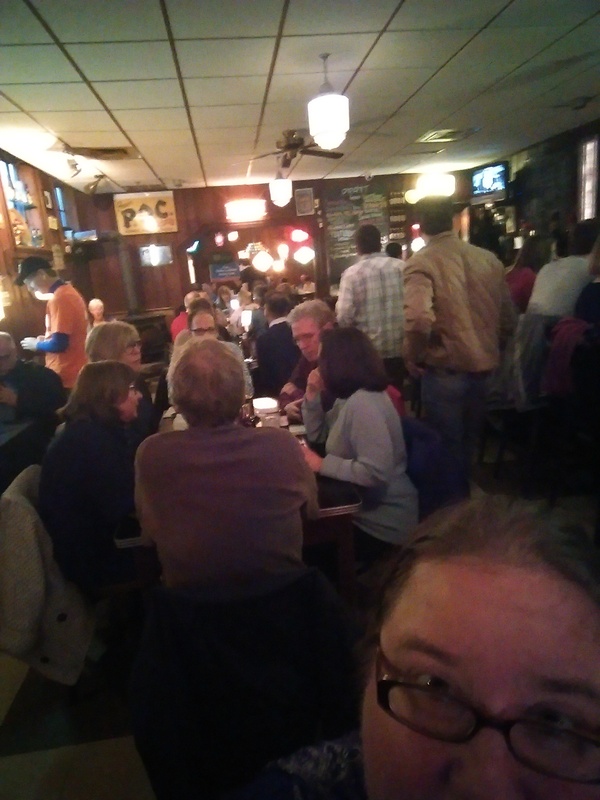 I hoped the rain and cold temps today would keep people home, but I still got there at 6 PM to reserve a table of 8 for my friends and me. I was told it would be a 1 1/2 to 2 hour wait. At 6:45 several of my friends showed up and several didn’t, so we were able to lower our seating count to 4. We were seated pretty soon after that (a little after 7). Pro tip: despite what the Plain Dealer article says, they take reservations all the way until 2 a.m. I had read “first come, first served,” but that only applies to seats at the bar. Once we sat down, we were given water, silverware, and blue fish fry menus advertising their Great Haddock Lenten Fish Fry as well as a couple pages featuring the normal menu and cocktails, beer and wines. Our waitress was efficient and had no problems breaking our table down into separate checks using our first names. It was refreshing and a huge relief considering how crazy busy they were. She took our drink orders and food orders at the same time since we were ready to order. Again, efficient. Due to fish fry volume, some regular fried menu items (like french fries and onion rings) are not available on Fridays. There are also no substitutions, but you are welcome to add things like pierogi or chowder onto your order. 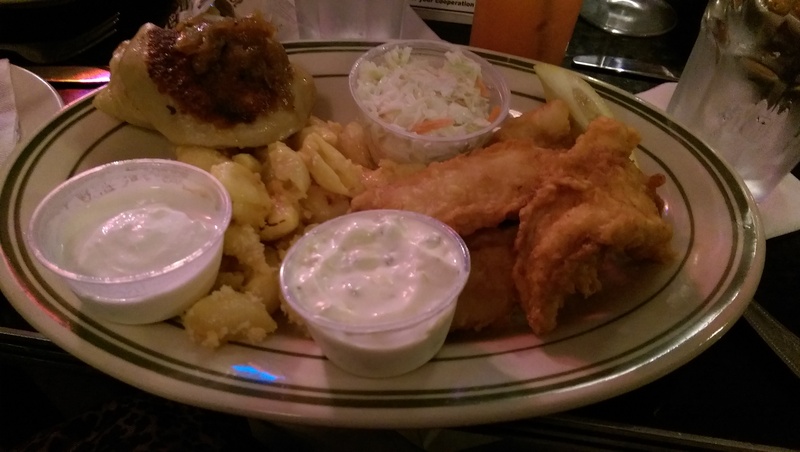 I chose the home-cooked “Gotta Haddock” classic fry, which features flaky beer-battered haddock along with a cup of New England clam chowder, two pierogi with caramelized onions, creamy old-school mac and cheese with shell pasta, and homemade coleslaw. The zesty house tartar sauce and sour cream came out with the meals in little containers. 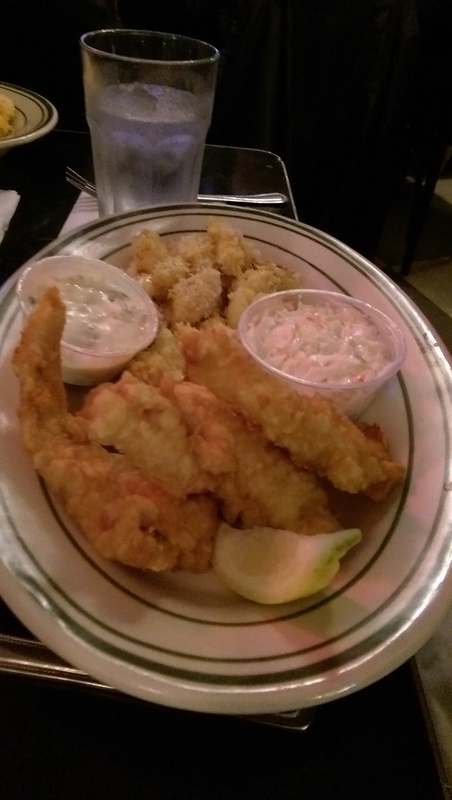 I loved that tartar sauce! 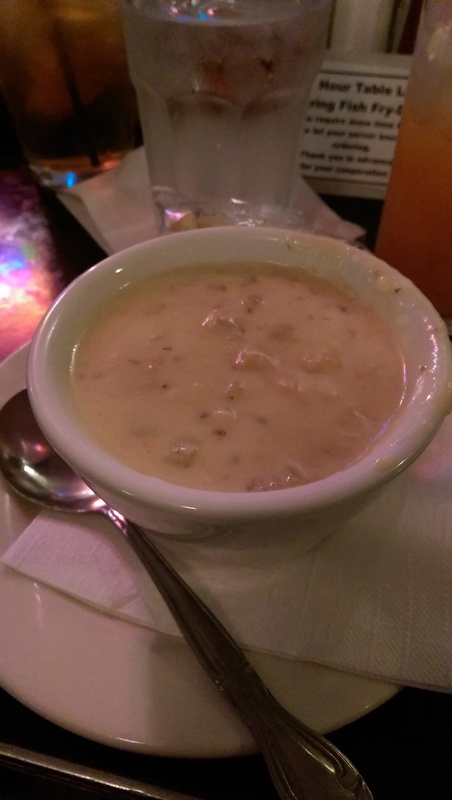 Also, the clam chowder was really good. It was nice and creamy and had lots of chunks of potato and clam. I could also taste a hint of the sherry they used, which was a really nice touch. 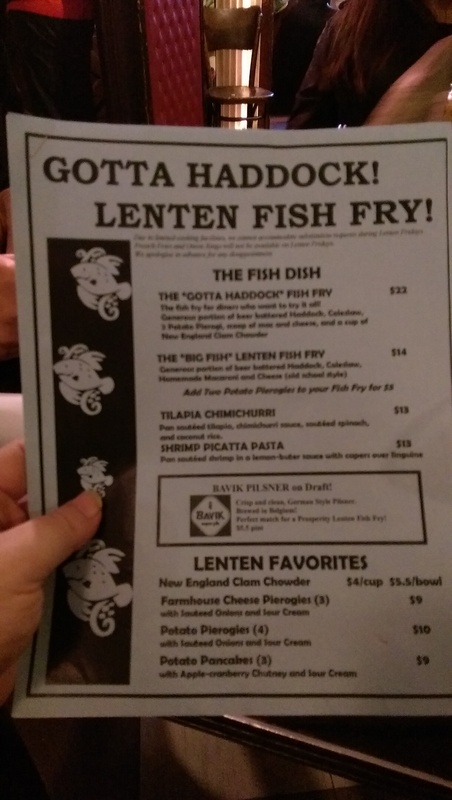 The haddock was perfectly fried and nice and flaky. The pierogi were a little overcooked (slightly burnt), but were still good. One of my fellow diners, who is new to Cleveland, had never had pierogi until tonight. The waitress quipped that he will be spoiled for life. I think he’ll be okay. We’re taking him to Sokolowski’s next time. Everyone really enjoyed their meals, and I enjoyed ordering alcohol with my meal. Being a fan of blood orange, I was going to order one of the beer cocktails with blood orange, but my friend pointed out that the Sol Rojo also had blood orange juice. It was so refreshing and delicious I ended up having two. Once we were sat at a table the service was super-fast. I was not quite done with my cup of chowder as the entrees came out. Tables are at a premium, so there is a sign asking diners not to linger more than an hour and a half on Fish Fry Fridays. We were out the door at quarter past eight. I would definitely go back to try some other things on the menu (like the shrimp picatta pasta), but I will be sure to make a reservation next time. I did enjoy chatting with my friends as we stood by the door (I didn’t mind the cold since it was so packed) waiting for our table (and it allowed us to talk a bit before things got crazy and we were busy eating), but being whisked to a table as soon as you walk in sure did look nice. I took exactly half of my dinner home and looked forward to having it for lunch. It was even better the next day.